Schedule & Contact for Patients. Dr. Yenn is a surgeon practicing as an assistant general surgeon in (gastric bypass, hernias), and orthopedic surgeries. He spends most of his working hours in the operating room (O.R.). Also, as a podiatric surgeon, Dr. Yenn has been performing foot & ankle surgery for the past 14 years (includes residency). His surgical training included 2 years from both USC County Hospital and Long Beach Memorial Hospital. 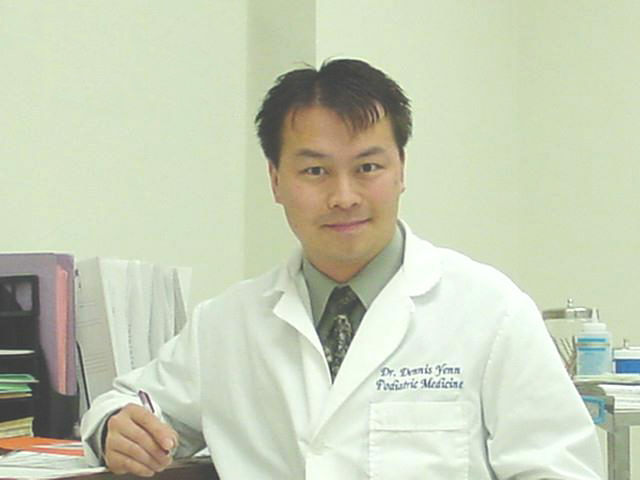 Dr. Yenn is board certified by the American Board of Multiple Specialties in Podiatry in Diabetic Foot. He is currently an active staff podiatric physician and surgeon in Los Angeles at: Hollywood Presbyterian Medical Center map, St. Vincent Medical Center map, and Temple Community Hospital map. He is serving multi-specialty medical clinics in Los Angeles. Please choose a location and convenient day of the week below. Then call for an appointment to meet Dr. Yenn. Schedule may vary. Hospitals provide free van transportation to and from your house on the day of the surgery. * Operating Room (O.R.) Assisting: general and orthopedic surgery; hospital consults; or board & care.